Gunnar Lettow, plays his electric bass using an assortment of different preparations such as spears, clips, brushes along with the use of effects units and field recordings. Gregory Büttner plays a loudspeaker cone fed with a non-audible very low frequency sine wave and places different resonating objects on the vibrating speaker membrane. In addition he plays several objects from in everyday life on a computer fan, which he uses as a rotating surface. After many concerts as a duo and in combination with other musicians, this is the first release of the duo Gunnar Lettow / Gregory Büttner. The two pieces were recorded on the 4th of June 2013 in Hamburg. While ‘Ocher‘ is a edit of a longer piece, the first one ‘Greyish‘ is untouched. Music, mix & mastered by Gunnar Lettow & Gregory Büttner. Cover photo by Gunnar Lettow. This trio of 3" releases from 1000füssler arrived together and, though doubtless not intended this way, their relative (by no means great) self-similarity makes it difficult not to hear them as a kind of a suite, and an excellent one at that, all three being very enjoyable. 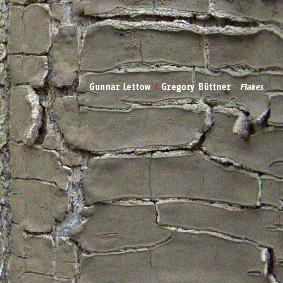 "Flakes", two tracks from Lettow and Büttner, almost seems like a fuller, denser variation on "Onagro", although entirely unrelated. Fashioned with multiple objects and instruments, including fans, the listener is once more plunged into a quite palpable sound-world, a-boil with movement, one's ears caroming inside a more closed area, the noises a bit more oppressive. Growls, thrums, deep ratcheting--a general sense of darkness prevails, especially in the first cut, "Greyish". The other, "Ocher", is just barely lighter, airier, still twittering with all sorts of vaguely malevolent creatures. Rough and tumble, as harsh as need be, brooding and altogether fine. A duo release of Gunnar Lettow and Gregory Büttner. The first plays electric bass, electronics, objects and field recordings and the latter loudspeaker, a low sinus wave, fan and objects. The have played a whole bunch of concerts, but this is their first release together. It was recorded June 4th 2013, which made me think this is all improvised. The fan is a computer fan, which Büttner uses to play objects against the rotating fan, as well as objects on the low vibrating cone from the speaker. The two pieces they have here are the most improvised ones from these three new releases. It is music in which the process seems to be very important and part of that is actually seeing what's going with the objects and how these sounds are generated. Hearing is perhaps only half the fun. It's a very solid release, but of these three also the one that is least easy to access. For completists and hard-core improvisation freaks. Three mini CDs arrived on 14 February 2014 from Gregory Büttner and his 1000füssler label in Hamburg. (...) Flakes is a tad different to the above works, in that it involves Gunnar Lettow actually performing on the electric bass and doing some live electronics, and it’s more like the document of a live action. Lettow turned his back on a promising career in the rock band Nice Noise just so he could pursue his “prepared bass” experiments, which means he uses the typical crocodile clips (purchased direct from Keith Rowe’s online store) and objects inserted into his strings, along with an array of effects pedals. However, his aim at all times is to produce forms of interesting noise rather than music, and he’s fond of microtonal events. Label boss Gregory Büttner joins him with an electric fan, a loudspeaker, and a low sine tone, making this a near-classic example of performed electro-acoustic noise improv, over speakersxso we’d have to throw in the word “acousmatic” too. Growly, groany, gritty noisexalso very droney and object-centred. A shade more “controlled” than Amptext above, yet I like the way it’s full of unpredictable turns, and there’s a strong attention to detail, meaning that every single one of these 18 minutes is packed with meaning and event, and nothing is wasted. GUNNAR LETTOW ist als Partner von Sylvia Necker in phase~in und als Kurator der Reihe Frequenzgänge ebenso ein Hörbar-Nighhawk wie GREGORY BÜTTNER als 1000füssler-Macher und Partner von Birgit Ulher oder Guy Saldanha. 'Greyish' ist keine schlechte Synästhetisierung für das, was sie da als die größere Hälfte von Flakes (021, 3" mCD-R) schmurgeln und tönen. Lettow mischt präparierte und durch Electronics und Feldaufnahmen flankierte E-Bass-Sounds mit Geräuschen, die sein Partner erzeugt, indem er einerseits Krimskrams auf einer Lautsprechermembran 'tanzen' lässt, die er durch eine unhörbar tieffrequente Sinuswelle in Vibration versetzt, und andererseits mit einem rotierenden Ventilator in Berührung bringt. Das eine zeitigt rubbelnde, das andere knatternde, tausendfüßlerisch tickelnde Klänge, beides die gerippelte Oberfläche eines heftig köchelnden Suds. Manches klingt wie Handwerkskunst, die sich akribisch bohrend und schürfend zu schaffen macht, um eine bestimmte Struktur heraus zu präparieren. Die ächzend blasenden und schleifend knarzenden, erneut auch durchflatterten Strukturen gehören dann schon zu 'Ocher', dem zweiten, im Unterschied zum ersten nachbearbeiteten Track. Man muß da die Phantasie eher bremsen, damit sie sich keine dämmrige Wildlife-Artikulationen einbildet von weiß der Geier was. Wobei das Bild zweier Erwachsener, die mit der Sorgfalt von Diamantschleifern und dem Fortpflanzungsprogramm von Grillen 'nichts' als Krach machen, eigentlich keine Übersetzung mehr braucht. Дуэт владельца лейбла и Гуннара Леттова (Gunnar Lettow) представленной записью дебютирует на рынке релизов, хотя музыканты достаточно давно играют вместе. Естественный ход импровизации, находящейся в рамках электроакустических идиом, в первом треке почти статичен и развивается скорее вглубь. Бюттнер работает с динамиками и их препарированием, Леттов модифицирует до неузнаваемости звук бас-гитары. То один смолкает, то другой, но совместных пауз почти нет, музыканты постоянно передают “эстафетную палочку” друг другу. Эта сыгранность очень хорошо чувствуется и делает музыку живой, будто это общение. Второй номер мини-альбома продолжает эту линию, но всё же он больше заполняет собою пространство. Очень хороший дебют.